Tongue-and-groove assembly is standard in today’s manufacture of wood flooring. Wood, being a product of nature, varies greatly in durability and workability, depending on the properties of the individual trees. Tongue-and-groove assembly is standard in flooring planks. Pine and spruce flooring both come from aromatic evergreen conifer trees, and both are available in tongue-and-groove flooring planks. In addition to a few similarities, pine and spruce also have some differences. Both pine and spruce are softwoods, and neither one will hold up as well under heavy traffic as hardwood such as oak or maple. Pine, however, is common as flooring because it’s still suitable for the purpose, and it’s cheaper than hardwood varieties. Spruce is less common, and Steve Thomas, host of “This Old House” magazine, feels it “would not hold up well on the floor”. The look of a pine floor will vary with the grade of the wood. 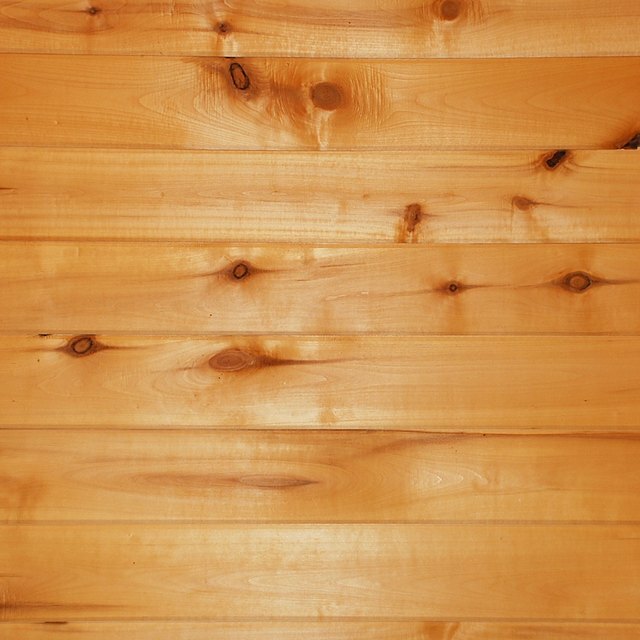 Top-grade pine is light cream or gold in color with an open grain and only a few small knots. Rustic pine grades, however, may feature numerous large knots and wavy grain disparities. Spruce is also an open grain, and it’s lighter in color than pine. Some spruce varieties are nearly white in color. With tongue-and-groove capability, you’ll only be cutting the wood planks to fit the edges of the room. Scribing the planks, which involves cutting detailed configurations to fit the planks around cabinet or stair configurations, is easier with pine than it is with spruce. Pine cuts smoothly, but spruce is fibrous and elastic, making clean detailed cuts harder to attain. You can buy pine or spruce tongue-and-groove planks with a finish already applied. If this is the case, once they're installed, you’re done. If the wood is unfinished, you can stain either wood a darker hue, but pine requires the application of a sanding sealer, which seals the high resin content in the wood and allows pine to absorb wood stain evenly.